Montignac-Lascaux is a small picturesque town of some 3,400 inhabitants situated in the Vezere valley – the centre of Pre-history. 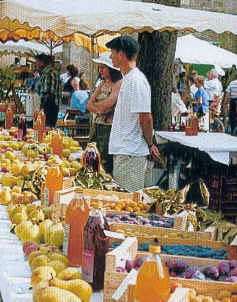 It is a busy market town, thriving on farming and tourism. There are a good selection of shops, cafes and restaurants to suit everyone all within walking distance of ‘Les Granges’, so no need to drive. In the summer there is a town barbecue every Monday by the river. Some of the timbered buildings in the centre of Montignac date back to the 13th century. The larger towns of Perigueux, Brive and Sarlat are only half an hour drive away. Other beautiful regions and wine growing areas are within easy reach such as the Lot, Quercy, Correze, Limousin and Charente. Bordeaux and the coast are a two hour drive. 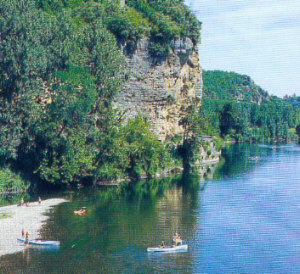 Montignac is an ideal centre in which to base a holiday. There are numerous archaelogical and historic sites to visit foremost of which is the painted cave at nearby Lascaux. There are also a variety of sporting and leisure activities. Our cottages are in a semi rural location bordering the River Vezere but only a few minutes walk out of town with all its facilities. It is a safe haven for children. 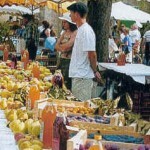 In Montignac there is the vibrant International Folk/Dance Festival held annually in July. In addition there are many classical music recitals held nearby – notably at St. Leon sur Vezere and St. Amand de Coly. Activities in the surrounding area….. The Dordogne valley in southwest France epitomizes the Europe of storybooks, with castles perched on cliffs over the Dordogne river and fortified towns still echoing with battles of the hundred years war. In towns such as Rocamadour, one of the key pilgrimage sites in Christendom, medieval buildings spill down the steep cliffsides. Equally fascinating is the prehistoric art that has survived some 17,000 years in the region’s extensive caves. And in tranquil farms of the Perigord we find truffles, walnut groves and geese raised for Foie gras – staples of the superb dining along your route.